Canadians tend to be a left-leaning bunch. Because of our 'first-past-the-post' voting system, however, we can end up with a Conservative majority government with just 35 percent of the popular vote. Project Democracy aims to change that by pushing Canada's divided left to vote strategically for the candidate most likely to defeat the Stephen Harper-led Conservatives. With Stephen Harper's lingering lead in the polls, some online groups have been pushing voters to cast their ballot for someone -- anyone -- who might prevent him from serving yet another term as Prime Minister. Project Democracy goes one step further, arming users with knowledge about their riding and showing the most-likely candidate to defeat the Conservatives. The website is easy to use: just type in a postal code, and it shows graphs of projected outcomes for the riding's candidates, as well as the riding's voting history. “Really, it’s about the idea that knowledge is power, and that cooperation is powerful,” Alice Klein, editor of Toronto-based NOW Magazine and co-founder of Project Democracy, said over the phone. “Cooperative voting”, as Klein calls it, is voting for the progressive candidate with the highest chance of preventing a Conservative riding, regardless of whether the candidate is Liberal, NDP or Green. “We have a structural situation – we have a united right, and a divided left,” Klein said. The idea of cooperative voting caught on during the 2008 election, in which Klein and her team set up VoteForEnvironment.ca, a website providing picks for candidates in to defeat the Harper Conservatives. Since the website proved successful, it has been reincarnated as Project Democracy to unite left-leaning Canadians against Stephen Harper. Klein explained that the website’s projections will give voters “one-stop shopping” for information on the riding level, and mobilize non-voters to get out to the ballot box. “People who haven’t been voting because it doesn’t seem worthwhile can check into Project Democracy. You can really see what kind of value your vote would bring,” she said, referring to “swing” ridings where a Conservative candidate is neck-and-neck with another candidate. 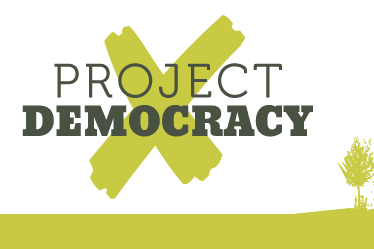 Project Democracy is among several websites that are pushing voters to defeat the Harper government. Swing 33 allows users to “donate strategically” to non-Conservative candidates in swing ridings that were won by a narrow margin in the 2008 election. Anything But Conservative pushes people to vote for just that. Klein said the website, which had its soft launch on Monday, has already been well-received by the public, getting 10,000 unique visitors on the first day. It's generating the same buzz as Vote For Environment, which brought over 440,000 unique users and credits itself for playing a key role in forcing Harper into a minority government. What is Project Democracy's aim in this year's election? After a lengthy and thoughtful pause, Klein summarized her position: "a change of government." 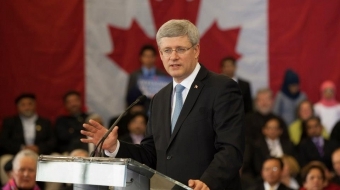 "If not, our bottom line is to block Harper from a majority government," she said.